The public has a right to feel safe in their house, the people’s house: City Hall. But that wasn’t the case during the council hearing May 9, when Mayor Sam Liccardo repeatedly threatened to throw out members of Bay Area Homeowners Network (BAHN) but never followed though. BAHN members seemed to think an effective tack to take was shouting down speakers, booing and mocking speakers, and generally intimidating and harassing people sitting near them. It was clearly an approach Mayor Liccardo was willing to allow for more than four hours, and it illustrated why an urgency just-cause ordinance was needed to protect tenants. If this was how BAHN behaves when they’re trying to prove what model “housing providers” look like, imagine how they act toward their tenants when a disagreement arises. A disabled man testified that it was “a war between the rich and the poor” and BAHN members drowned him out with boos. A landlord testified that she feared for her safety if the ordinance passed, as if her tenants turned into bloodthirsty vampires upon its passage. Several members of the public repeatedly asked the law enforcement present in the chambers to intervene and take action against these bad actors, but police said their hands were tied until Liccardo specifically ordered a person thrown out of the hearing. Only after a housing advocate pointed out the hypocrisy of the handling of the May 9 meeting compared to the much tamer April 18 meeting—when a housing advocate was ejected for less confrontational actions—did Liccardo start to follow through with his numerous threats. But it took more than four hours of unacceptable behavior. This wasn’t the first incident. During all the community meetings leading up to and including the April 18 City Council meeting, rent control opponents have bullied, harassed, intimidated and photographed rent control supporters. They just grew a lot bolder over the last year. At the May 4 San Jose Unified School District (SJUSD) meeting, a member of the public was harangued during their public comment by board member Paymon Zarghami. Not only was this a violation of the Brown Act, but also it’s an example of the public being intimidated when trying to address concerns at public meetings. This is yet another intimidation tactic, just a little more creative. Every person who spoke was filmed, and many charter opponents were photographed while speaking at the dais—obviously not for promotional purposes. They did not ask SJUSD for permission to post the notice and when it was brought to the board’s attention, the attorney advised them to remove it. And on a side note, even publications such as this have examples of free speech being under attack. I’ve seen countless folks try to discuss an issue only to be harassed, ganged up on and intimidated by the same trolls. Free speech must be protected, no matter what side of the issue you’re on. When the public is allowed to be dominated, bullied and intimidated by one side of an issue, we can only assume it’s based on bias, campaign donations or a general lack of respect. It is incumbent on all elected bodies to protect free speech and those rare few folks who show up to exercise it. San Jose must do better. Free speech is certainly endangered. Groups like ANONYMOUS, OCCUPY, and a new one ANTIFA have been attacking and beating people up they disagree with in full view of the San Jose PD and Mayor Liccardo. might take issue with a loud crowd in city hall. What was the saying , “No Justice, No Peace”. You were the teacher Sam and your students read “Rules For Radicals” . Enjoy that cold dish you served called revenge. Rather than trust my comprehension of this Op-Ed to a single reading, it is my intention to give it a second go, that is, if I have enough liquor on hand to achieve the level of impairment necessary to make sense of it (without first succumbing to alcohol poisoning). These criticisms aside, having observed Ms. Cartwright blocking entrances to public buildings I must compliment her on her god-given talent as a human obstacle. I think the Federal Bureau of Land Management (BLM) solved the “free speech” problem long ago. 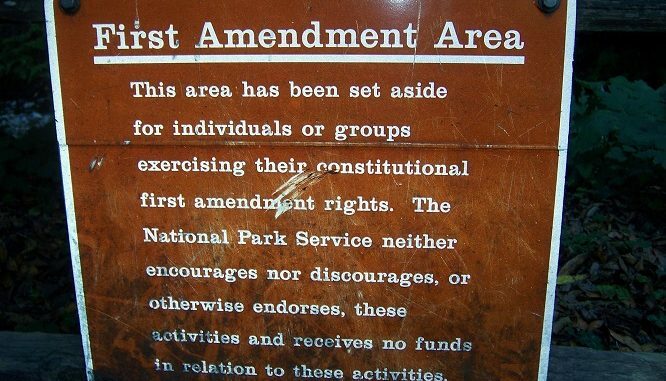 Simply find a quarter acre of useless land under a freeway overpass, deed it over to the BLM, and have them designate it as a “First Amendment Area”. The legal standard for having the police eject people from a public meeting is extremely high – so high that the mayor would be foolish to risk it. The Brown Act would allow him to clear the room, under certain circumstances, but again it’s a high bar, and will almost certainly end in a lawsuit. The Brown Act expressly allows photography and videorecording in a public meeting. There is absolutely nothing the mayor could have done to stop it. The law doesn’t protect you from having your picture taken in a public place, and posting your image or likeness is completely legal unless someone is making money off of it. When you are talking about people who are trying to avoid having their property rights taken away for political purposes, a bit of civil disobedience is to be tolerated, if not applauded. Anyway, nothing could be more foolish than imposing rent controls or other unnecessary restrictions on building in an area already suffering from a scarcity of housing. Hello, wake up. Are you at San Jose Inside living on the moon? You liberals and the Democratic Party of hate have been attacking free speech for the last several years. Just look around, but your mainstream media never talks about it.